"I still remember your interesting lessons, your funny toys from Binary Arts, the humorous patterns on your clothes and your smile. But the most thing I remember is your method and deep insight through the problems. Obviously it is very valuable for me to learn and study." This is a typical response Dr. Andy Liu gets from students of all ages with whom he comes in contact. Last summer, Liu spent 144 days travelling in Asia volunteering his time visiting students in his native China and Taiwan, while thinking up questions for the International Mathematics Olympiad. One can only imagine the excitement and pride that Hon-Shien Liu (no relation), a Grade 7 student, must have felt as he submitted for publication in Taiwan a mathematics paper that he co-authored with Liu. The dedication Liu shows overseas is also present at home. He has co-authored papers with many young mathematicians here in Edmonton as well. These students are part of the popular Saturday afternoon math club he started in 1981. Open to all young people interested in math, it's not a tutoring session, Liu is quick to point out. "A club is a club and some of them don't listen to a word I say." Liu runs the club on his own time and has built up an impressive array of puzzles and games to inspire the children and keep them coming back. He doesn't charge for the club, not wanting to exclude any underprivileged kids from enjoying math. And the parents have no recourse to come back at him, he chuckles. Obviously, Liu likes working with young children and getting them enthused about mathematics. He says he enjoys the eight- to 10-year-olds the most. "At that point, they do not say 'I hate math,' and that's a good thing." Always putting in the extra effort to reach his students, Liu has learned how to write upside down so his students can see his explanations better. Liu has touched a lot of students both in university classes and in his many volunteer activities. It's one of the reasons he'll be recognized with two distinguished teaching awards this year. The first is from the Ontario Institute for Studies in Education at the University of Toronto. Liu is one of six winners of the 1998 Distinguished Educators Award. And the second is from the Canadian Council for the Advancement of Education (CCAE) and the Council for Advancement and Support of Education (CASE), who are honoring Liu as the 1998 Outstanding Canadian University Professor of the Year. He will receive a framed citation and $5,000 at a special presentation in June. A modest man with a sense of humor, Liu takes his honors in stride. "Being nominated is the big honor. Winning is just the icing on the cake. It's good for the university," he says. When asked why he thought he got the awards Liu says, "Beats me...I think whoever put out the proposal did a very good selling job." The truth is that his colleagues and students consider Liu a dedicated, excellent teacher. Graham Denham, a former student and friend of 18 years, now taking a PhD in mathematics at the University of Michigan, says Liu piqued his interest in math. Dr. Tony Lau, teaching committee chair for the department of mathematical sciences, says: "He is one of our very best teachers. The fact is, he's the only person I know who is willing to spend time all on his own on Saturdays, even when he was a student, to teach these younger children." "Teaching is not just a necessary evil, it is an interest of mine," says Liu, who holds a graduate diploma in elementary education in addition to his doctorate in mathematics. Liu's research interests span discrete mathematics, hypergraph theory, combinatorial geometry, foundations of mathematics, mathematical education and re-creational mathematics. He arrived in Canada in 1967 to do an undergraduate degree at McGill. 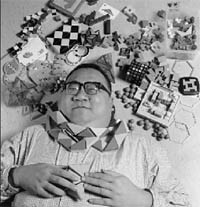 In 1970 he moved to Edmonton and continued his studies in mathematics. Currently, Liu is working with a colleague from Taiwan to sell a new puzzle, a new business that is a great example of applied mathematics, he says. He also loves to travel and is in the sunny climes of Colombia for several weeks, acting as an educational adviser and inspiring more young mathematicians.as only a professor like Andy Liu can.